If anything good came out of the Great Recession, it was the lesson—for consumers, at least—that debt can be a very unpleasant thing to have when the going gets rough. 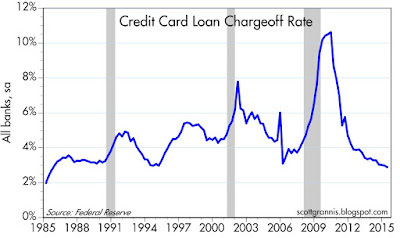 Consumers have taken that message to heart, by managing their credit card debt more carefully. 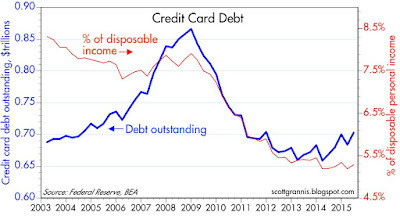 As the chart above shows, credit card debt outstanding fell from a high of $866 billion in 2008 to $703 billion as of last June. 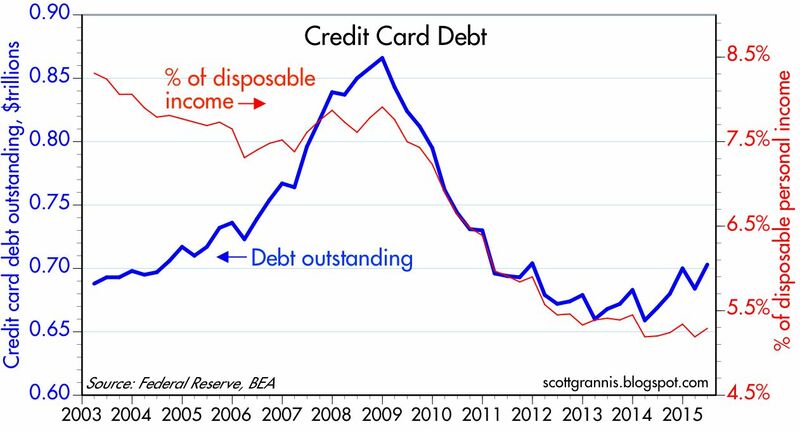 Relative to disposable income, credit card debt fell by fully one third over the same period. 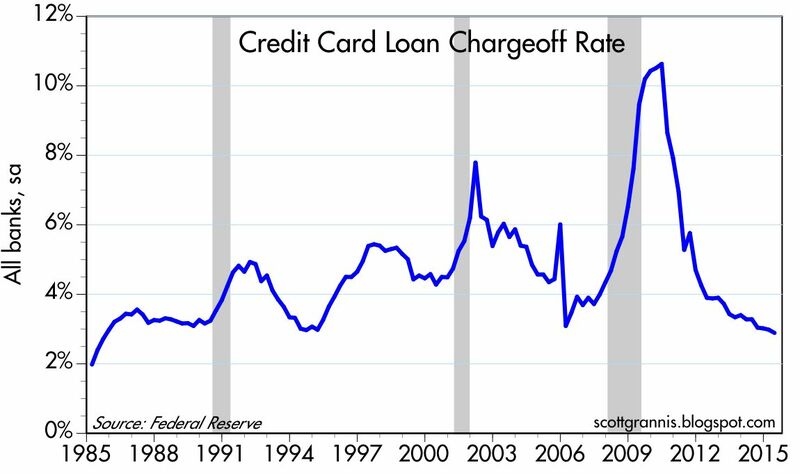 Reduced credit card debt, combined with rising incomes, has dramatically reduced the percentage of credit loans that banks have had to write off. 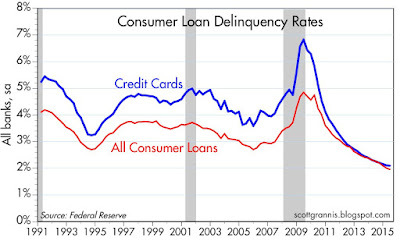 Consumer loan delinquency rates are at their lowest level over 25 years, and falling. 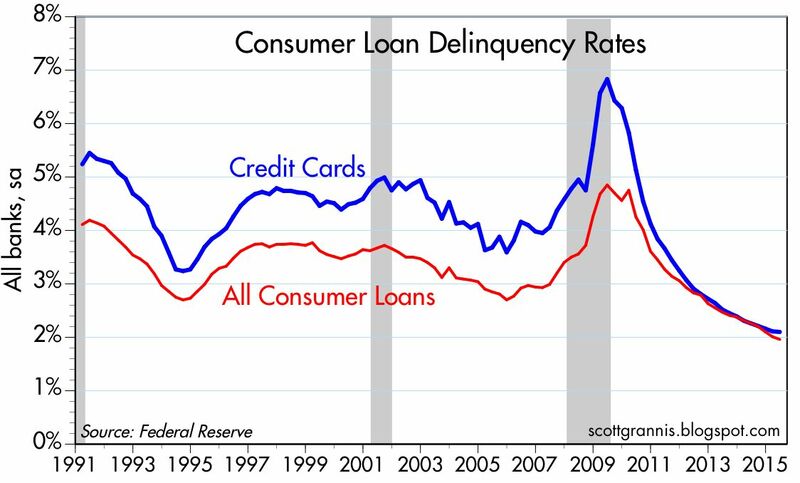 Bottom line: consumers and households have trimmed their exposure to debt and are managing their debt much more cautiously and conservatively. This is, arguably, one of the under-appreciated facts that contribute to a positive outlook for the future. It's ironic that the stock market suffered a huge "correction" only days before the second revision to Q2 GDP growth came in surprisingly strong. Sometimes the market gets carried away by emotions, and sometimes the economic statistics get revised significantly after the fact, so it pays to keep an eye on the fundamentals as revealed by key market-based prices (e.g., real yields on TIPS, swap spreads, the dollar, gold). 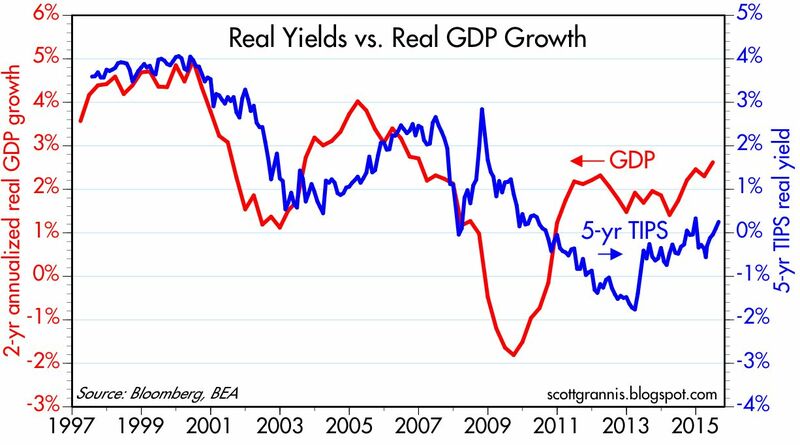 I've long argued that real yields on 5-yr TIPS were a good indicator of the market's expectation for the trend of real economic growth. As the chart above shows, the two tend to track each other over time. Real yields on 5-yr TIPS have moved quite a bit higher over the past two years, and now we discover that the economy strengthened over that same period. The annualized rate of economic growth over the past two years was 2.7%, a good deal better than the 2.2% annualized growth since the recovery started in mid-2009. . Despite the pickup in growth, however, the economy is still a lot smaller than it could/should have been. 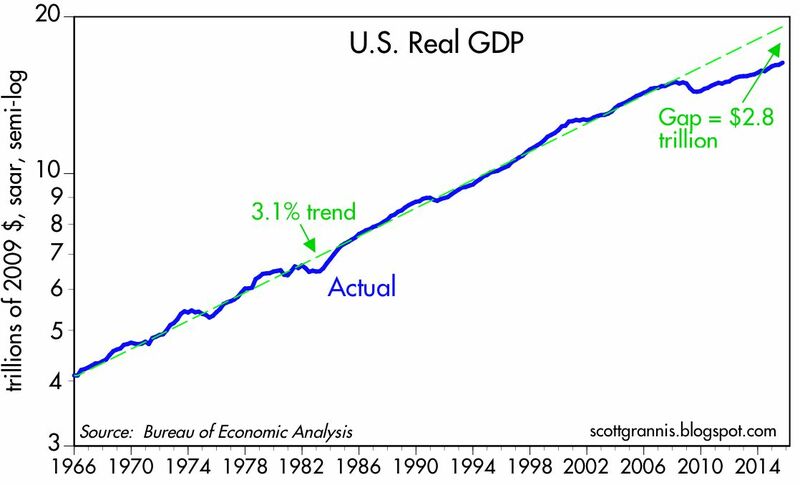 As the chart above shows, the shortfall in growth relative to long-term trends is about $2.8 trillion. Per year. We're talking about a lot of income that's being left on the table, and a lot of people unemployed or underemployed, most likely because of higher tax and regulatory burdens. Yesterday's GDP revisions also gave us the first look at corporate profits after tax for the second quarter. They reached a new nominal high of $1.82 trillion. 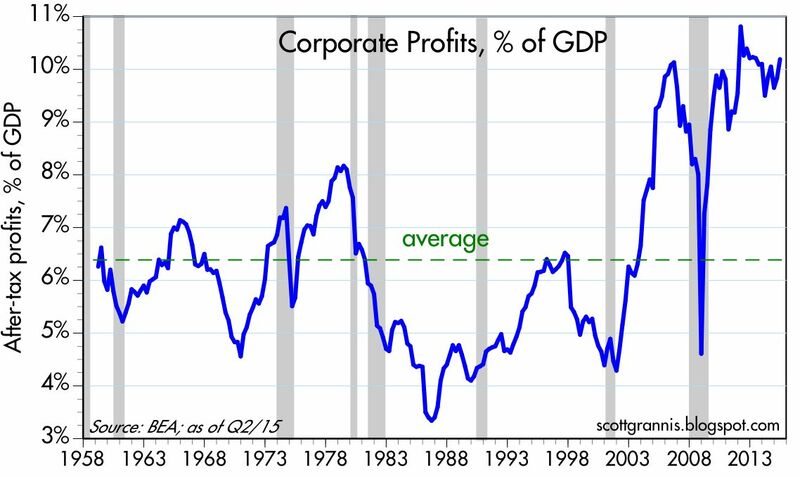 As the chart above shows, that puts corporate profits very close to an all-time high relative to GDP. From a long-term historical perspective, corporate profits have been exceptionally strong throughout the current business cycle expansion. 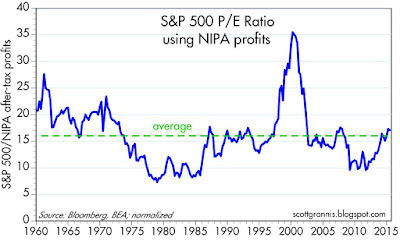 The chart above shows the PE ratio of the S&P 500 using the after-tax corporate profits (with adjustments for inventory valuation and capital consumption allowances and normalized in order to facilitate comparisons to reported PE ratios) as the "E" instead of trailing GAAP earnings. 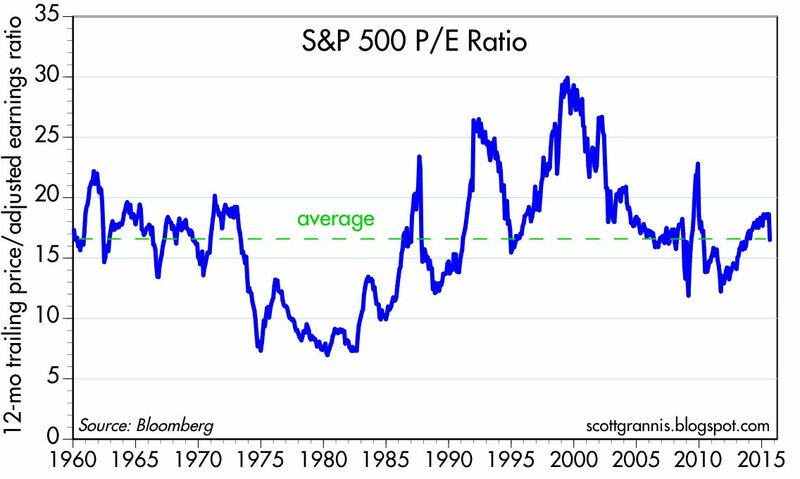 By this measure, the stock market at the end of June was trading very close to its long-term average valuation. What does all this say? The economy is doing OK, and has even managed to improve somewhat in recent years, despite all the moaning and groaning. 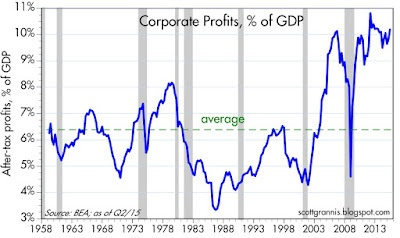 Corporate profits have been absolutely fabulous, and certainly supportive of higher equity prices. Stocks aren't in a bubble, and monetary policy hasn't stimulated the economy or caused equity prices to artificially inflate. So why is the market so worried? Why is the Fed so worried about the economy that they have to keep interest rates at zero? Sure, things could be a lot better, but we're not talking about a fragile economy that needs an extraordinary dose of TLC (aka low interest rates) to survive. 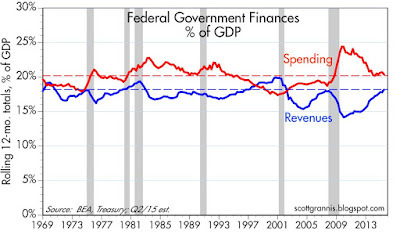 If we want things to improve, we need to look to fiscal policy, not the Fed. Only two charts from yesterday merit updating today, one the result of a bounce in stock prices and a drop in fear, the other the result of a further decline in 2-yr swap spreads. When stock prices move inversely to fear (as proxied in the above chart by the ratio of the Vix index to the 10-yr Treasury yield), it's a good bet that emotions are the primary driver. 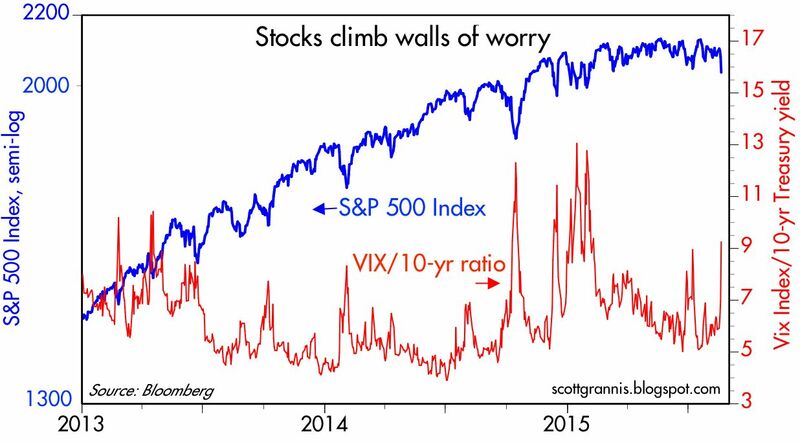 More and more this looks to be the case with the recent volatility in global equity markets. 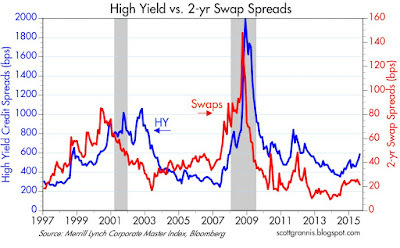 Swap spreads typically lead or track credit spreads, but not recently. 2-yr swap spreads in the U.S. are now a mere 14 bps, while high-yield spreads remain somewhat elevated. Equity and corporate bond markets are nervous about a deceleration in China's growth and a possible slowdown in the U.S. economy. But swap spreads are about as low as they get, which is a good sign that markets enjoy a healthy degree of liquidity and a virtual absence of systemic risk. This further suggests that elevated fears may be groundless—since they are as yet unaccompanied by any deterioration in the financial and economic fundamentals. The next two charts are updated versions of ones I have featured periodically. 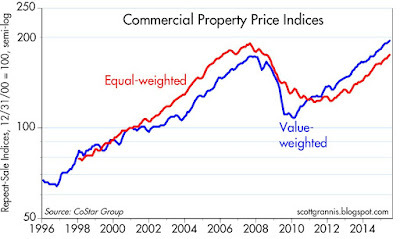 Both show that the commercial real estate and construction markets are quite strong. 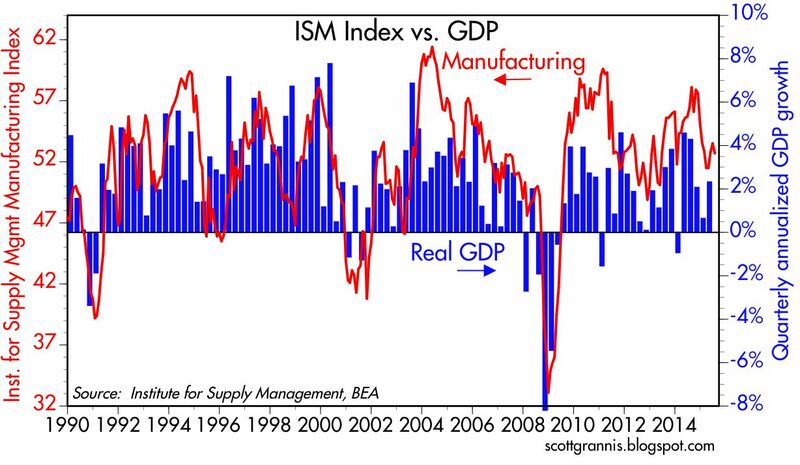 As such, they lend support to the notion that the economic fundamentals have not deteriorated, and the market's fears are arguably misplaced. 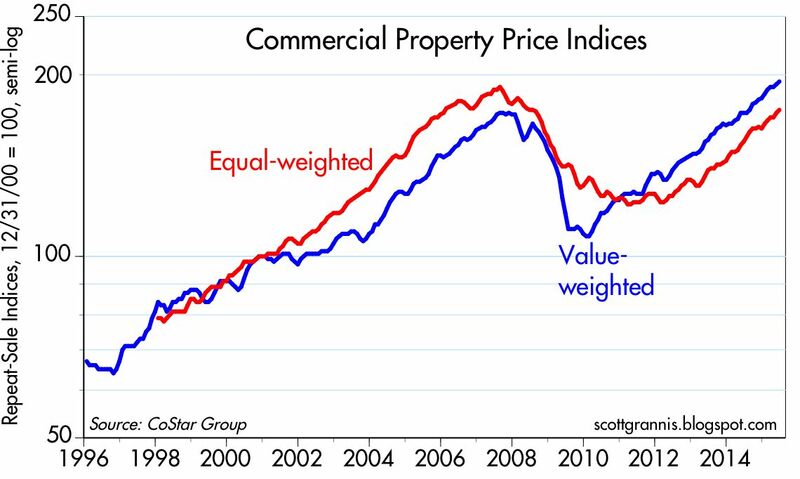 According to the folks at Co-Star, commercial real estate prices are booming. Prices have been rising at a 12-14% rate for several years now. This is one of the strongest economic indicators I've seen. 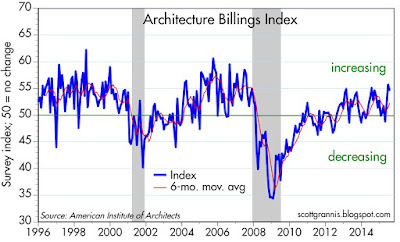 New business on the books of the nation's architectural firms is increasing, according to a survey by the AIA. 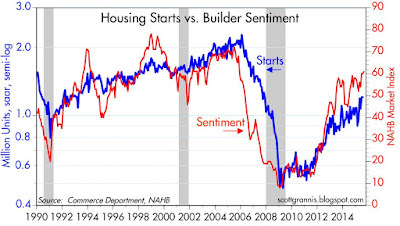 This points to increased commercial construction activity over the next year. Given the rather extraordinary volatility and nervousness of the market, I'm going to post updates of key charts as I'm able, with minimal commentary. 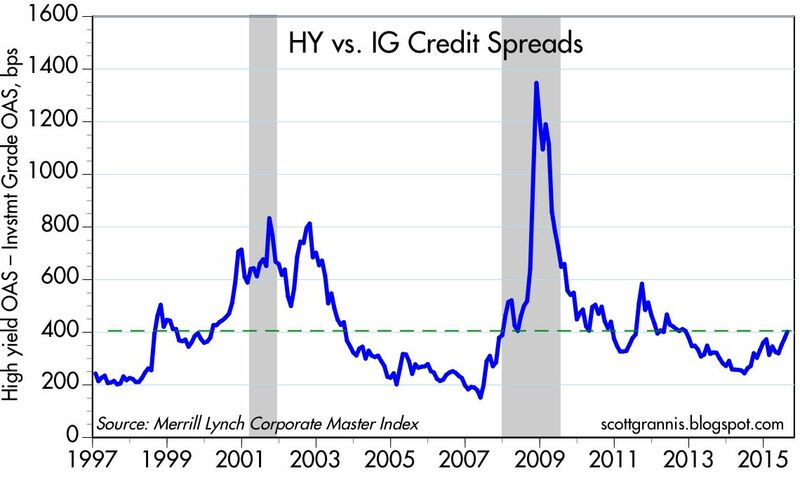 High-yield credit spreads are rising, but still relatively low compared to periods of real economic distress. 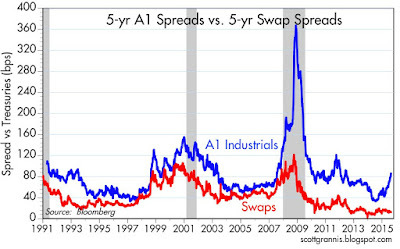 Swap spreads are declining, and are at levels which typically coincide with periods of economic tranquility. The energy sector is clearly the one most impacted by current conditions (i.e, collapsing energy prices). Defaults are very likely. The market has already priced in defaults on energy bonds of roughly $45 billion. 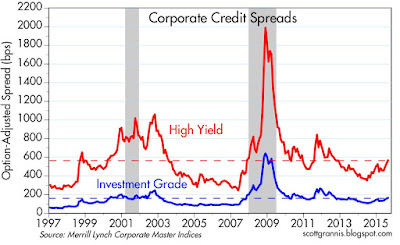 However, that's less than 1% of the value of outstanding traded corporate debt in the U.S.
All credit spreads have widened, but investment grade spreads are still relatively low and HY spreads are not at levels that are extremely worrisome (the energy sector accounts for most of the spread widening in the HY sector). 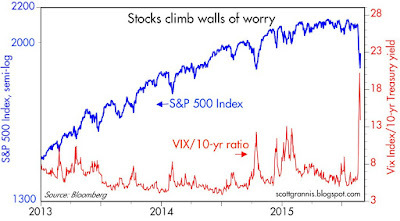 The Vix/10-yr ratio backed off a bit today, but is still VERY high, almost as high as it was at the apex of the PIIGS crisis in late 2011. The market is very fearful of the global economic and financial market fallout of a slowdown in the Chinese economy and collapsing energy prices. Lots of bad news is being priced in. 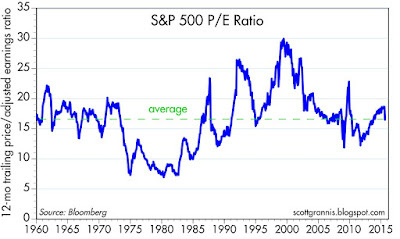 At 16.5 today, the PE ratio of the S&P 500 (according to Bloomberg) is equal to its long-term average. 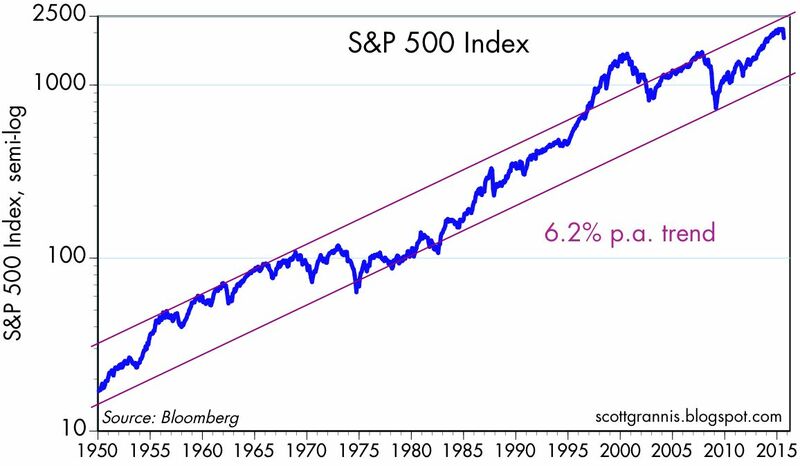 In the great scheme of things, stock prices remain in a long-term uptrend. The recent selloff appears to be a minor bump in the road. The prices of gold and 5-yr TIPS still appear to be slowly trending down. This suggests that the market is gradually losing the significant degree of risk aversion that it acquired in the wake of the PIIGS crisis. It also suggests that the market's demand for "safe" assets is declining on the margin. Both are consistent with a market that is regaining some lost confidence. This is of course very much at odds with the huge rise in the Vix/10-yr index, and is perplexing, to say the least. 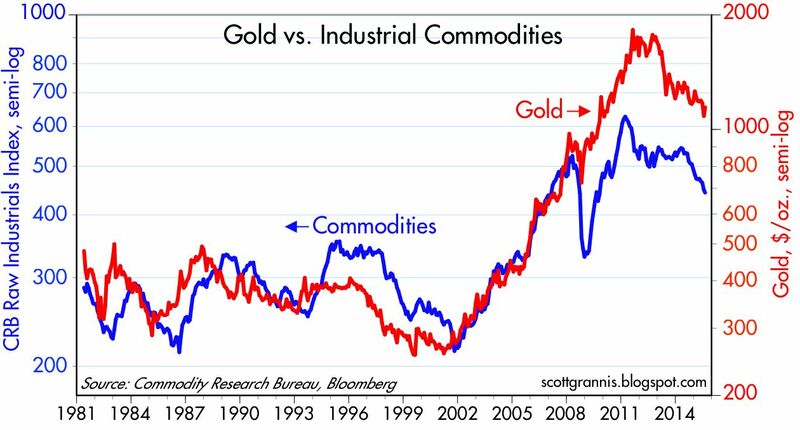 Commodity prices have been trending down for several years now, but are still quite high relative to where they were a decade ago. It's impossible to say whether the global economy will unravel—sending shares lower still as the fundamentals finally do deteriorate—but the market seems to be pricing in a good chance of such a possibility. If you're going to panic and sell here, you need to be very worried that we are on the brink of a global economic disaster. Crude oil prices have now fallen by almost 60% from last year's high. They've gone from being very expensive to now a bit cheap from a long-term historical perspective. I'd also note that virtually all recessions in the past 45 years have been preceded and/or triggered by relatively high prices of oil in real terms. With oil prices now into their second year of decline, we've seen only a brief slowdown in GDP, so I'm tempted to say that lower oil prices now make the economy less susceptible to a recession going forward. 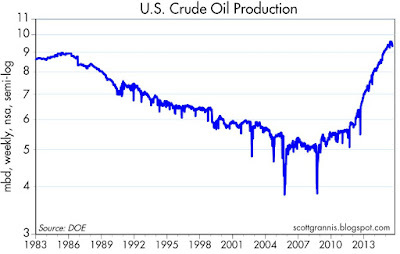 Cheaper oil is bad for producers, but very good for almost everyone else. The key risk factor is how vulnerable the balance sheets of oil producers are to today's low prices. 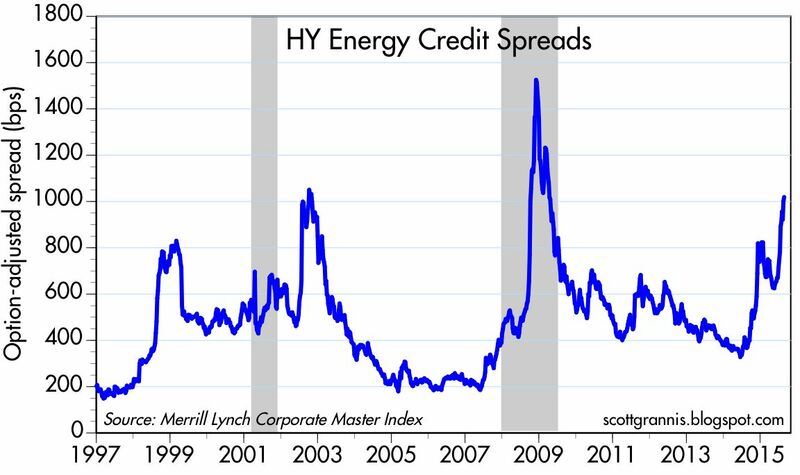 High-yield energy bond credit spreads are one way to evaluate that risk, and not surprisingly, they are high and worrisome. Nevertheless, the losses sustained by these bonds to date represent less than 1% of the value of all traded U.S. corporate bonds. This oil "tail" is unlikely to wag the corporate/economic dog, but that assertion does little to soothe a market that worries we're on the brink of another global recession. As before, I think this chart is key. 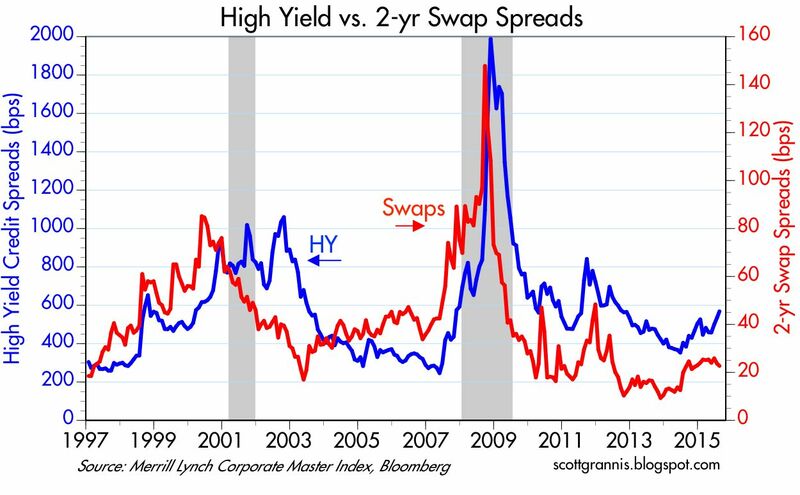 Despite the huge decline in oil prices, a substantial increase in high-yield credit spreads, and the recent 10% drop in equity prices, swap spreads are relatively low and declining. This is a stunning (and very reassuring) disconnect. If we were truly on the brink of another recession, swap spreads would almost surely be high and rising—but they're doing just the opposite. This lack of confirmation (the swap dog that didn't bark) points squarely to the current market rout being driven much more by panic than any deterioration in the economic fundamentals. The current level of swap spreads tells us that markets are very liquid and systemic risk is low. A big economic disruption is thus unlikely. It's notable that oil's most recent decline has coincided with a decline in the value of the dollar. 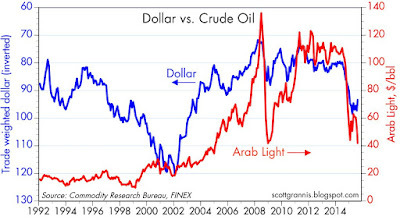 On a long-term time scale, oil prices tend to correlate inversely to the value of the dollar, as the chart above shows. I continue to believe that recent action tells us that lower oil prices are the result of a supply shock (think fracking) rather than overly-tight U.S. monetary policy. It's not a shortage of dollars that is depressing oil prices, it's a surfeit of supply, and that's good news for consumers. The most welcome impact of falling oil prices is lower inflation expectations, as seen in the chart above. The market now expects the CPI to average about 1.1% over the next five years, mainly because of sharply lower oil prices. But when the bond market looks past the current oil decline, it sees the CPI averaging 1.9% over the subsequent five years—that's the message of 5-yr, 5-yr forward inflation expectations built into TIPS and Treasury prices. That's very much normal. 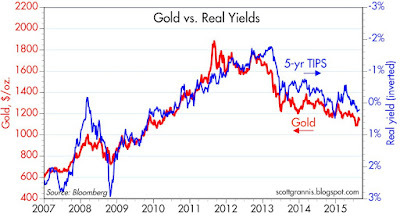 It's also notable that the prices of 5-yr TIPS (using the inverse of their real yield as a proxy) and gold have barely budged despite the recent global equity market turmoil. This is one of those scare scenarios that has caused large equity portfolio managers to hit the "sell" button—not a generalized unraveling of the global economy or financial markets. The last time we saw a wall of worry this high was back in September 2011, when the PIIGS crisis reached its apex. Unlike today, however, swap spreads were high and rising in late 2011, as the world not only worried about the health of the Eurozone economy but also the health of the Eurozone banking system. Today, despite the huge increase in the Vix/10-yr ratio, swap spreads are low and declining. 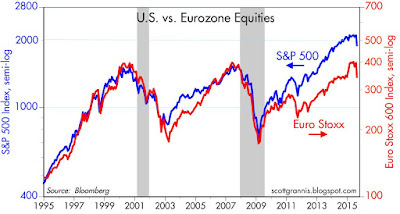 U.S. and Eurozone equities suffered much greater losses in late 2011 than they have in the recent selloff. They rebounded nicely once the PIIGS crisis proved to be not so dangerous, and they can rebound again if the global economy fails to collapse. And, by the way, US exports to China are only 0.7% of our GDP, so the health of the US economy is not terribly dependent on the health of the Chinese economy. Once again, the world is in a tizzy as falling oil prices threaten the profits of the energy sector, which in turn sparks fears that this could spread to the rest of the economy. Once again, I think these fears are overblown. 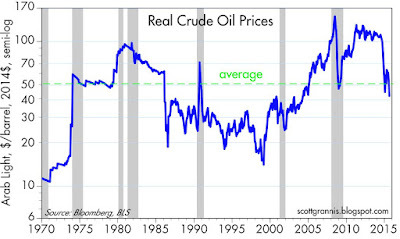 Putting things in perspective, oil prices in real terms are only slightly below their long-term average. The energy sector has taken a real hit, but the evidence of contagion is still hard to come by. Swap spreads remain low, and that suggests that markets are liquid and systemic risk is low, so even though the pain and suffering is acute in the energy sector, the rest of the economy looks fine. 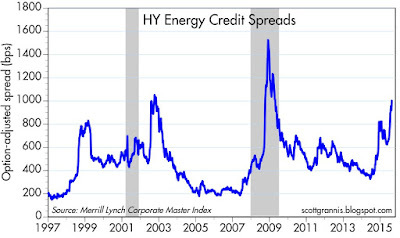 Credit spreads in the high-yield energy sector are quite high, suggesting a meaningful risk of widespread defaults. 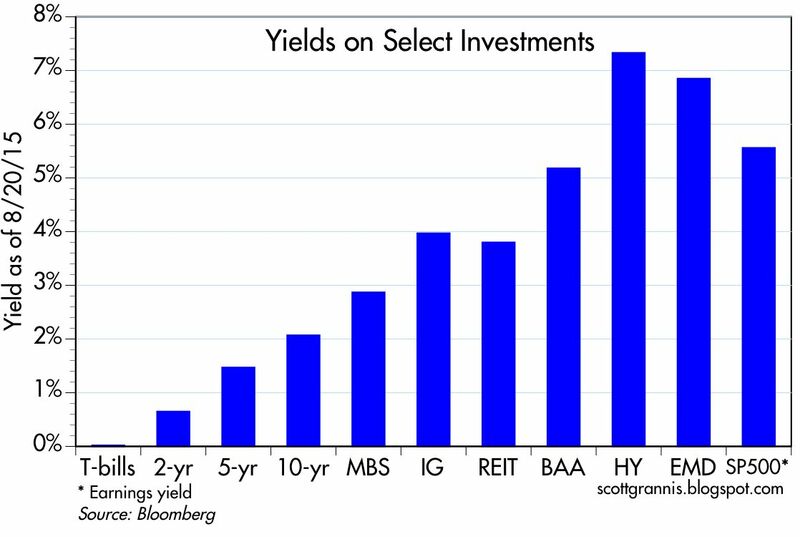 The average bond in this sector has suffered a 25% drop in price, erasing a total of about $40 billion of the sector's value. That's not chump change, but neither is it an existential challenge to a market (high-yield corporate bonds) with a total market value of $1.3 trillion. 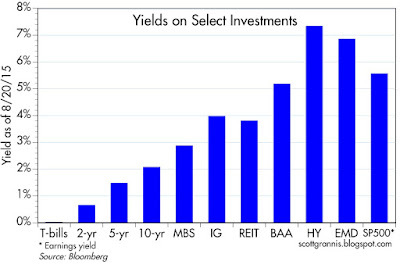 Meanwhile, the market value of investment grade corporate bonds is about $5.4 trillion. So the losses in the HY energy sector represent about 0.6% of the value of all traded corporate bonds in the U.S. 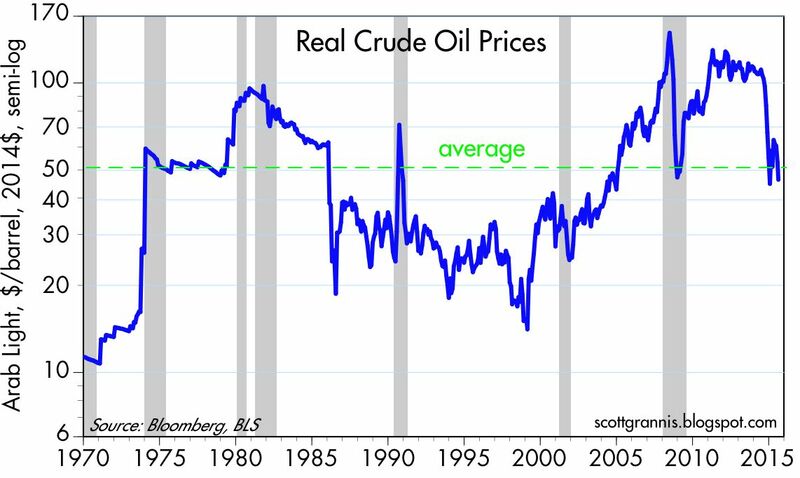 The decline in oil prices in the past year has been deep and precipitous, but when viewed from an historical context, all that has happened is that oil has gone from being very expensive to about average. The chart above suggests that the main reason for the decline in oil prices is a giant increase in U.S. crude oil production. When greater supplies result in lower prices, that is a very good thing for consumers. As the chart above suggests, monetary policy is not the main culprit behind lower oil prices. 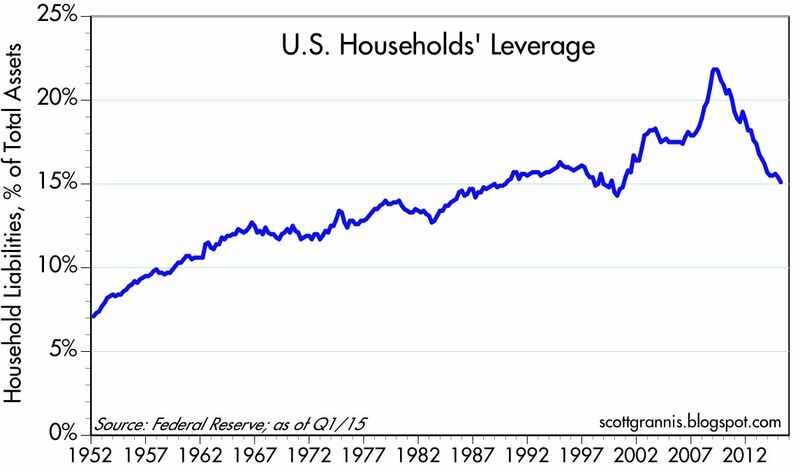 We're not talking about a generalized deflation which is the by product of overly-tight monetary policy. The dollar is trading at very close to its long-term average, and so is crude. The dollar has been relatively stable for most of this year, even as oil prices have gyrated. The Fed is not about to "tighten" monetary policy anytime soon (one or two hikes in short-term rates doesn't equate to a tightening—it's just the Fed making policy less accommodative), so there likely is no fundamental shortage of dollars in the world, and no reason therefore to think that all prices are at risk of declining. 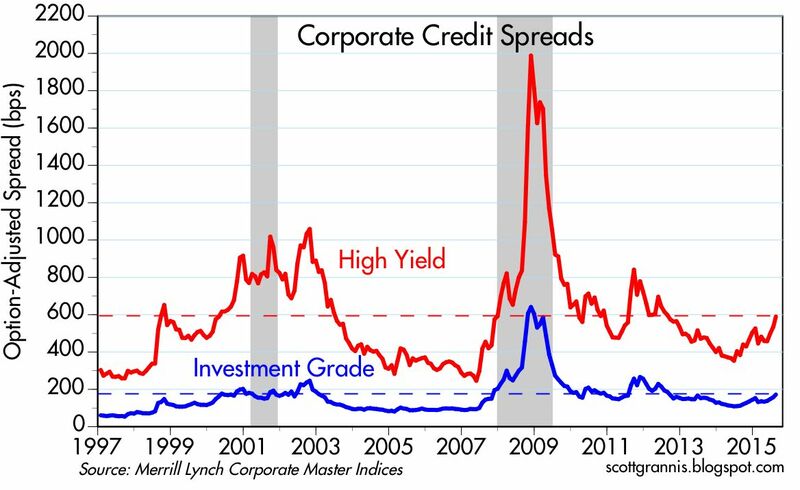 Corporate credit spreads in general are elevated, but still far less than they were during periods of recession. The difference between junk and investment grade spreads is also elevated, but still relatively low compared to periods of great financial and economic stress. The chart above is key: while credit spreads have risen meaningfully, swap spreads have remained in "normal" territory. 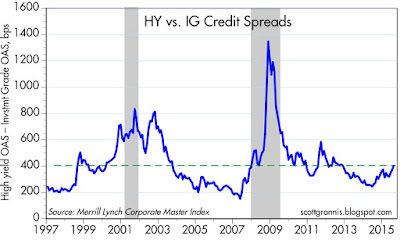 Real problems happen when swap spreads rise by a lot, at the same time other credit spreads rise. That's not the case today. Swap spreads are not confirming the supposed contagion risk of defaults in the energy sector. They are saying that the contagion risk of lower energy prices is well contained. In the chart above we see that 5-yr swap spreads are also quite tranquil, even though spreads in the high quality industrial sector have jumped. So the current bout of fear and trembling is likely to pass. The market is once again climbing a "wall of worry," worrying about something that has a low likelihood of become a serious problem. This is most likely a correction, not the beginning of another recession. Those who worry about the value of risky assets must forgo a considerable amount of income in exchange for the safety of cash, as the chart above shows. This is symptomatic of a market that is still quite fearful in general. In effect, the market has priced in a substantial amount of bad news already. The main impact of lower oil prices has been on inflation expectations, as shown in the chart above. This is how it should be. 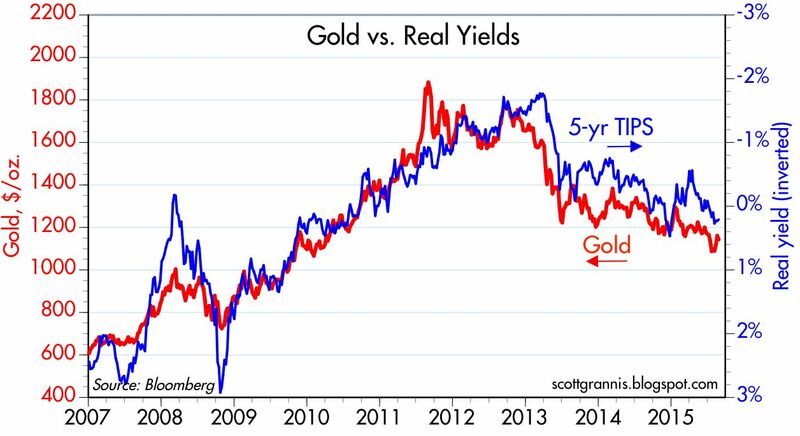 For all the fear and trembling out there, gold prices have only managed a minuscule bounce, and real yields on TIPs have been in a rising trend for several years. 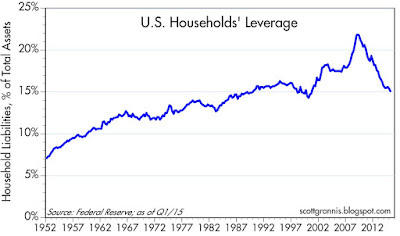 This chart is not signaling any major problems. Most importantly, rising real yields and very low swap spreads suggest that the economic fundamentals are improving, not deteriorating. We've climbed walls of worry like this one before. I suspect we'll do it again. 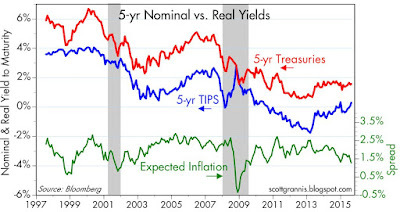 Thanks to TIPS (Treasury Inflation Protected Securities), the U.S. bond market gives us a reliable and up-to-the-minute reading of the market's inflation expectations, unsullied by seasonal adjustment problems, immune to the ministrations of statisticians, and not subject to after-the-fact revisions. 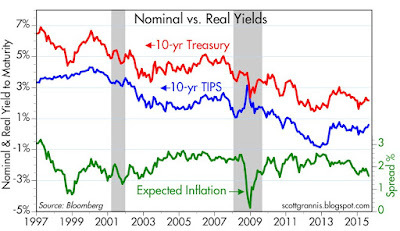 For the past several months, TIPS have been telling us that inflation expectations have been declining—though only moderately: deflation is still nowhere to be found. 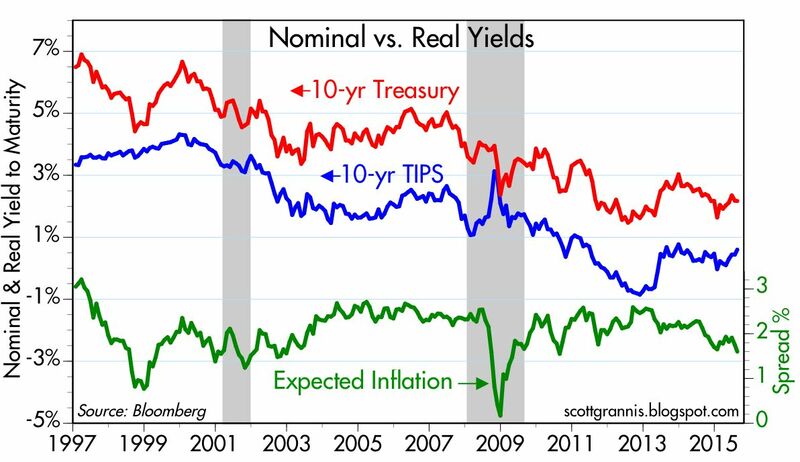 At the same time, the rise in real yields on TIPS tells us that the market is expecting somewhat stronger growth—though still far less than enough to erase the economy's huge output gap, which I estimate to be about $1 trillion per year. It's a message that should do nothing to derail the Fed's plan to normalize interest rates at a somewhat higher level, and it should do nothing to provoke an outright tightening of policy. Slow and relatively stable growth, accompanied by relatively low inflation, is not very exciting, but it's not something to worry about either. It's supportive of continued, modest gains in equity prices. In the chart above, the difference between the nominal yield on 5-yr Treasuries and the real yield on 5-yr TIPS gives us an expected annual (CPI) inflation rate of 1.27% over the next 5 years. This is relatively low compared to past history for this series, but it is nowhere near the levels that reflect deflation risk, such as we saw at the end of 2008. 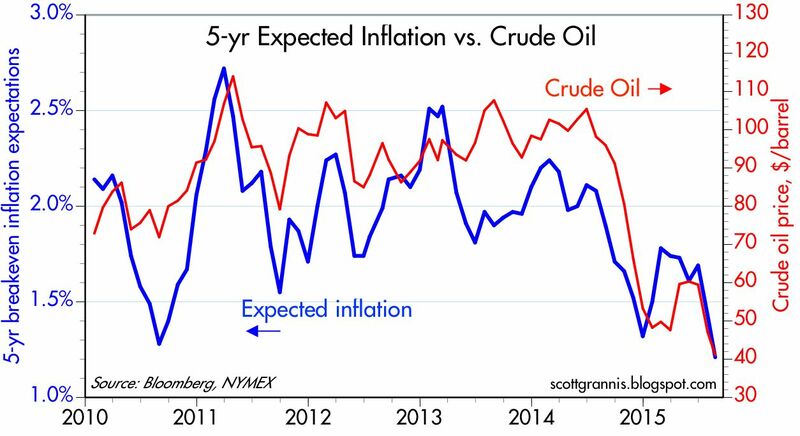 As the chart above shows, the recent decline in this same expected inflation rate over the next 5 years is driven by and large by the price of oil. Lower expected inflation is not a symptom of tight money; it is the by-product of strong gains in oil production. As such, this is a welcome development, since a lower cost of energy enables a stronger economy. The Fed's preferred measure of inflation expectations, the 5-yr, 5-yr forward expected inflation rate (derived from TIPS and Treasury prices) is 1.99%. The chart above shows the average expected inflation rate over the next 10 years, which is 1.59%. In other words, inflation is expected to average 1.27% over the next 5 years, 1.99% over subsequent 5 years, and 1.59% for the full 10 years. There's nothing unusual or worrisome with any of these numbers. 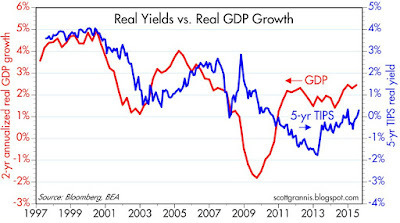 As the chart above suggests, the real yield on 5-yr TIPS tends to track the economy's growth rate. 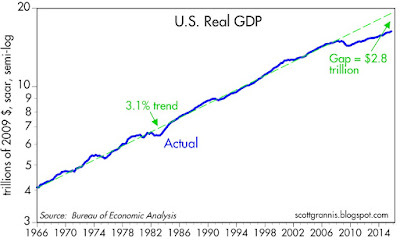 Which makes sense, since the real growth of the economy sets an upper limit on the real growth of its constituent parts. If the bond market is comfortable with risk-free real yields of 0.3% for the next 5 years, then real growth in the broad economy is quite likely to be somewhat higher. This year's increase in real yields suggests that the market is pricing in a modest acceleration in the rate of GDP growth over the next year or so. Nothing to get excited about, but nothing to worry about either. 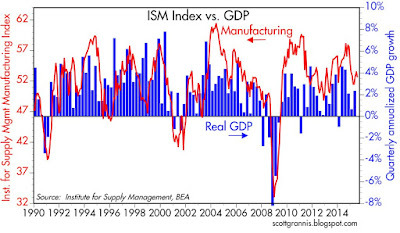 The ISM manufacturing index has generally tracked the real growth rate of the economy. Its current reading suggests we should see GDP growth of at least 2-3% in the current quarter, a modest acceleration from the second quarter's growth rate. 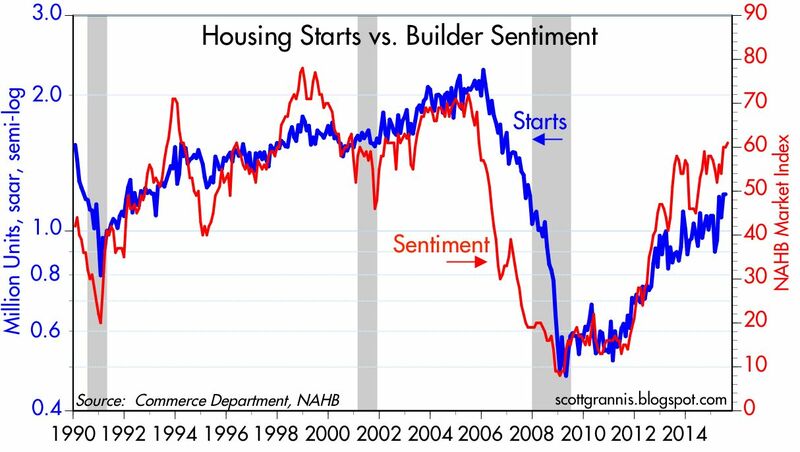 July housing starts came in much stronger than expected (including revisions to prior months), and they are tracking well with a survey of builder sentiment. 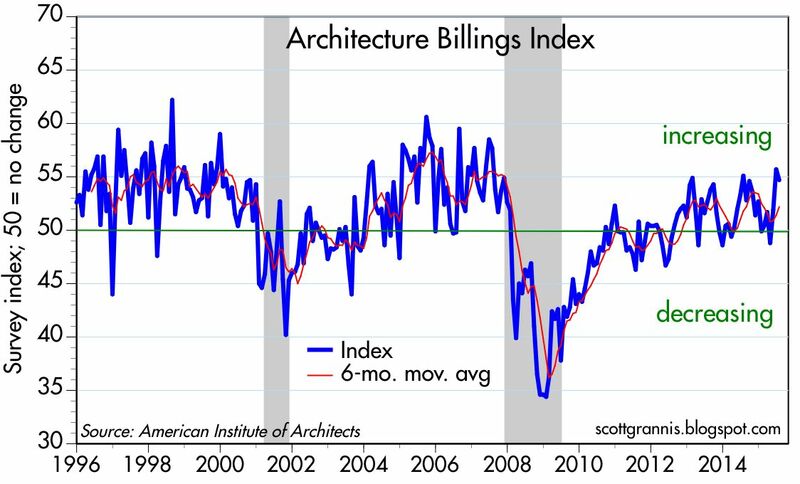 Housing has been expanding vigorously for the past 3-4 years, and there is every reason to expect further gains in the year ahead. This equates to a strong vote of confidence that the economy will remain healthy for the foreseeable future. The physical weight of stuff carried by the nation's trucks increased 3.7% in the year ending July. This is a pretty good indication that the economy is growing. 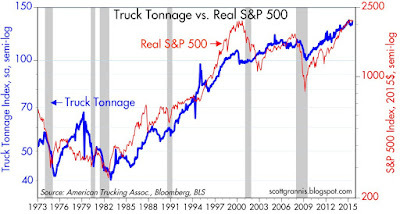 As the chart above shows, truck tonnage correlates reasonably well with the real value of U.S. equities. 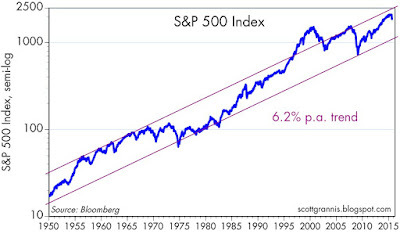 As the economy expands, real stock prices increase, which makes sense. The modest increase in truck tonnage in the past years suggests that the stock market is not in a bubble (neither undervalued nor overvalued), and is likely to increase modestly for the foreseeable future. Not too long ago, it looked like the U.S. federal budget deficit would be measured in the trillions of dollars and double-digit percentages of GDP for as far as the eye could see. Fortunately, the future didn't turn out to be nearly as bad as expected. 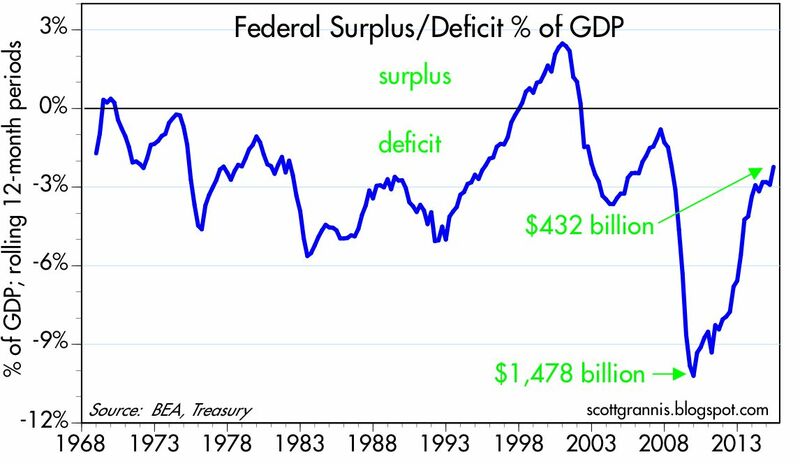 In the 12 months ended July 2015, the federal budget deficit was only $432 billion, or 2.2% of GDP. What was once a source of impending catastrophe is now just business as usual. Although conditions in the U.S. economy are far from optimal (about $3 trillion per year too far), they are orders of magnitude better than they could have been or were expected to be. Here's a brief recap of one of the more promising developments in the U.S. economy in recent years. 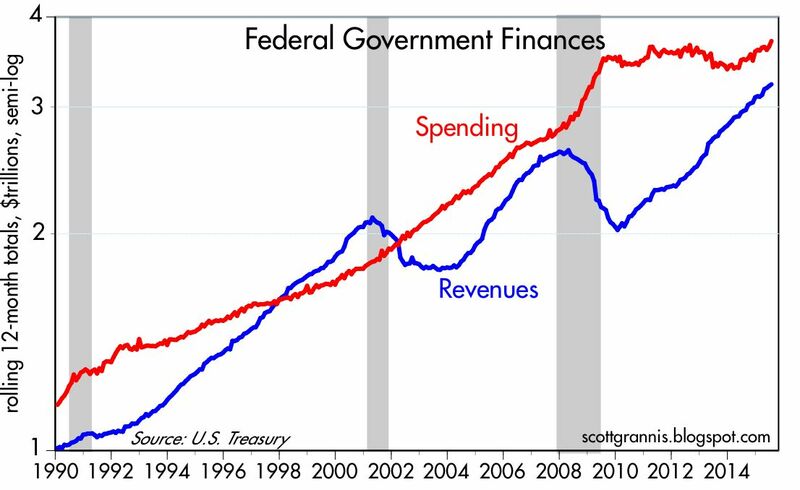 The budget gap has narrowed considerably, thanks mainly to spending restraint and growth in federal revenues which has averaged about 8-10% a year since 2009. Most of the latter is due to the fact that jobs and incomes have steadily increased, and corporate profits are very near all-time highs, both nominally and relative to GDP. In other words, thanks to budget austerity and economic growth, the deficit has returned to earth instead of heading for the moon. 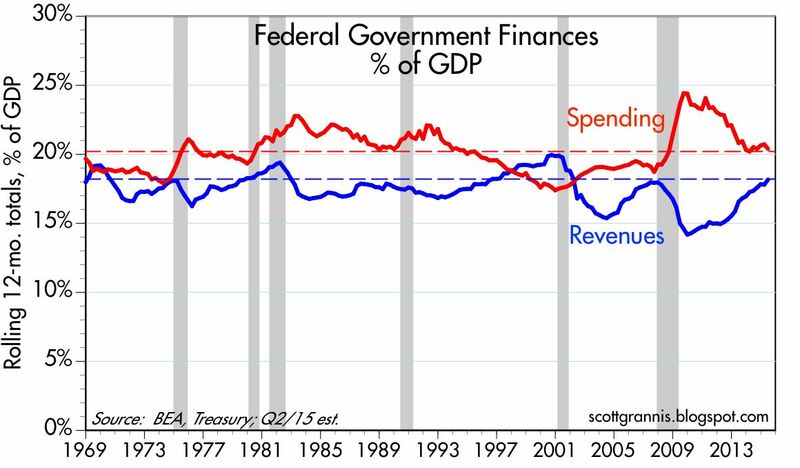 Relative to GDP, federal spending and revenues are very close to their long-term averages. It's nice to see that, although things could be a lot better, at least they are no worse than average. 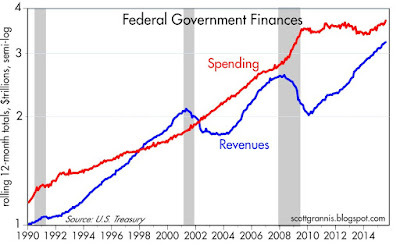 The budget deficit has collapsed to a mere 2.2% of GDP. Five years ago the deficit was $1.5 trillion; today it has fallen by more than two-thirds, to just $432 billion. 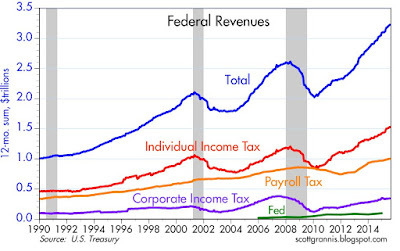 The lion's share of increased revenues—which are up by over 50% since 2009—has come from individual income taxes. 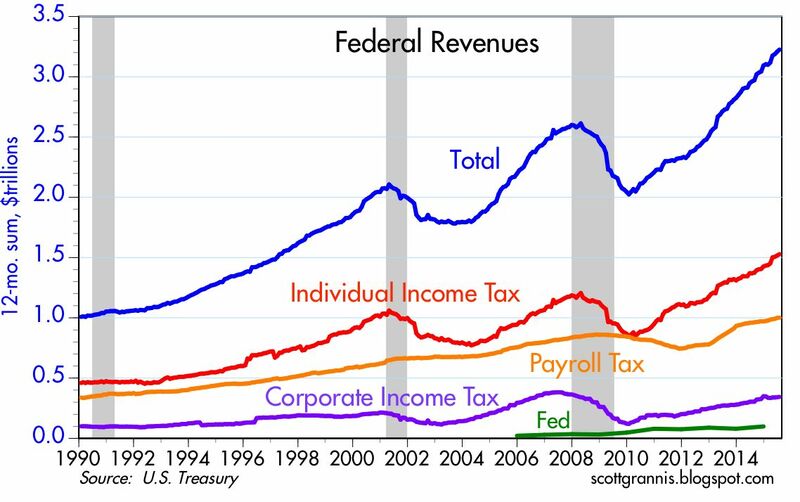 In the year ended last month, the federal government collected $1.53 trillion in individual income taxes, up 74% from the 2009 low, for an increase of almost three quarters of a trillion dollars. As election-year politicking picks up, it would be nice to see some candidates using these figures to argue for significant cuts in the top marginal tax rates for individuals and corporations. There's nothing wrong with the deficit today that continued austerity and faster economic growth couldn't cure. The "cost" of cutting marginal tax rates would almost surely be offset by faster growth. That's because, as I've pointed out repeatedly, one of the biggest headwinds the economy has faced in recent years has been high and rising marginal tax rates. That's why business investment and new business formation has been so weak—and what this recovery has been the weakest on record: on an after-tax basis, the rewards to taking risk and working harder are simply not attractive enough. Not to mention, of course, the burdens of increased regulations, which have surged with Obamacare and Dodd-Frank. Today's federal budget offers very fertile ground for positive changes in fiscal policy going forward, if only savvy politicians would take note.